Koya tofu is one of staple ingredients I almost never run out of in my pantry. It’s a traditional Japanese food. 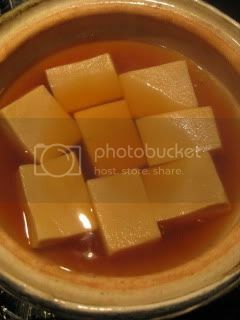 Koya tofu is freeze-dry tofu and is rich in protein and vitamins. To use koya tofu, you first need to rehydrate it by soaking in hot water for about 15 minutes and then press out the moisture. 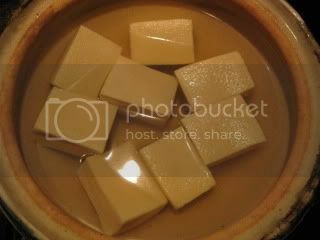 Rehydrate 2 pieces of koya tofu and cut into smaller pieces. 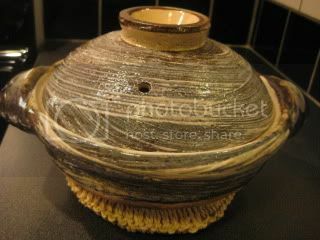 Combine 1.5C dashi stock, 2T sake, 1.5T mirin, and 1T raw brown sugar in donabe. Add cut koya tofu. Put a drop-lid (or just line the surface with a piece of parchment paper), cover wihth lid and bring to simmer. Simmer for 5 minutes. Add generous 2 tablespoons of usukuchi shoyu (light color soy sauce) and some shaved bonito flakes (2-3 grams, wrapped in a cheese cloth). Simmer for 1-2 minutes and turn off the heat. Let rest for a couple of minutes and remove a bag of bonito flakes. Garnish with some thinly-sliced yuzu rind and blanched snow peas. This is it! So nice.